Sell Your Home in 60 Days Without an Agent, and Save Thousands in Real Estate Commissions. Are you tired of real estate agents calling, asking how long you plan to "go it alone" before listing with a professional? Do you wish you could weed out all of the unqualified buyers looking for a rent-to-own, or a lease option home, and focus on the ready willing, and able buyers that are out there? Are you looking for a proven blueprint to price, advertise, and sell your home quickly, and for the most amount of money? FSBO Method covers the core home selling strategies you need, and gives you "Homer Simpson Proof" instructions on how to execute them. This step-by-step course walks you through every action of the home selling process. Learn the same strategies real estate pros use to price your home correctly. Engage buyers with an IRON CLAD 17-Point marketing plan that goes beyond "put an ad online, and home it sells". "Bulletproof" Contract to Close guide that guarantees you'll close on time. Your COMPLETE Roadmap for Pricing, Preparing, and Advertising. You Can Market Like an Agent and Sell Your Home! What do you want from your home selling experience? Why are you selling by owner? Obviously it's to save the thousands of dollars in real estate commissions. To help you get started on your sale we'll help you price your home correctly and competitively to ensure a positive outcome. How to Price Your Home Correctly and Competitively in Your Market. Where to find, and how to use pricing tools available to you - 90% or more FSBO's are doing this one wrong! How to obtain and utilize a Comparative Market Analysis - Why it's a good idea to use a real estate agent to your advantage. Calculate your Net Proceeds - The fun part: Estimate how much money your will walk away with. With hundreds of homes on the market just like yours, it's important to stand out from the crowd and be as appealing, memorable, and move in ready as possible. How to ensure your home is in it’s best condition possible - If your home is not in the greatest condition, it could sit on the market longer than needed. 47 ways to make your home sell faster - A proven checklist that takes out all of the guesswork to prepare your home for selling. How to think like a buyer - When you were a buyer something attracted you to the home you purchased… You'll learn how to highlight your major selling points. Why investing in repairs will actually earn you more money - As soon a a buyer walks through your home, they begin subtracting from the sales price in their head. You can overcome this with just a few tweaks and updates. The best photography options - Understand the pros and cons of taking photos yourself and investing in a photographer. You'll also get do it yourself tips as well. Module 3 - Execute a Professional Level, 17-Step Marketing Plan. Learn how to develop progressive marketing strategies to engage your potential buyers. 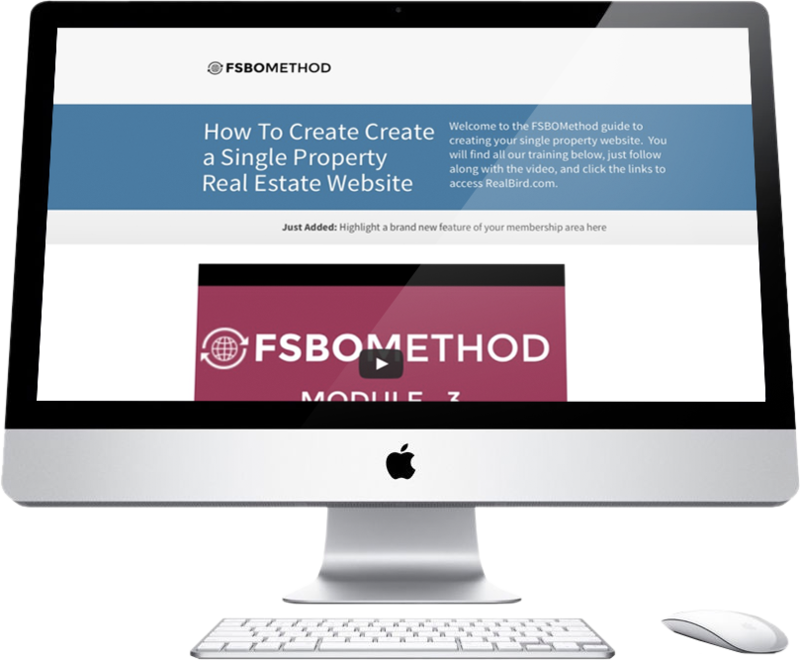 Create a Single property website - You’d be surprised how many FSBO’s never create a website to market their homes. This one is a game changer. Syndicate Your Home on National Real Estate Portals - Once your website is up and running, we’ll show you how to list your home on Trulia, Zillow, Yahoo! Homes, and more. Classified Services Done Right - Most FSBO sellers place an ad or two on Craigslist and call it good. Here you’ll get the best practices for where to post, when to post, and how to “capture” more buyer leads. Search Engines - By building a dynamic and powerful website, and using the keyword techniques we provide, you’ll have a great chance of showing up organically on Google, Bing, and Yahoo! Exposure on Social Media - Use your Facebook, Twitter, and LinkedIn accounts to promote your home. You’ll even learn how to post a virtual tour on YouTube without actual video. Find your prospects, turn them into BUYERS, and seal the deal with Module 4 of FSBO Method. Tips to Secure Showing Appointments Over the Phone, and by Email - It’s important to be comfortable with who comes into your home. Quickly qualify potential buyers before they make a visit. Showing Instructions, Feedback Response, Scheduled Follow Up - Effectively Automate these three tasks just like an agent’s showing service. Doing this puts you way ahead of the pack, and gets the attention of buyer’s agents. Receiving Your First Offer - What to do, when to respond, and how to counter like a pro. Responding to Low Offers - It is not uncommon for a buyer to “low-ball” a FSBO seller. We’ll teach you how to react, and counter offer, potentially saving the sale. Agreeing to Terms - Real estate contracts are more than just price and closing date. It’s important to know about all potential contingencies, and other terms and conditions that a buyer may include in their offer. How to Prepare for and Manage Inspections. Setting Up and Being Present for Appraisals. Coordinating Closings With the Buyer and/or Buyer’s Agent. Receiving Your Final Settlement at Closing. Any feelings of skepticism you may have about investing in a new product is completely normal. This is why I’ve decided to put all the risk back on me! You have 60 full days to test drive the entire course and put it into full action. If you do not get the results you expected, or you feel this course was simply not for you-there’s no hard feelings! Simply send us an email and we will immediately refund your money-and you can keep the entire course along with all of your special bonuses absolutely free! No! Questions! Asked! This is just my way of thanking for your decision to invest in FSBO Method.